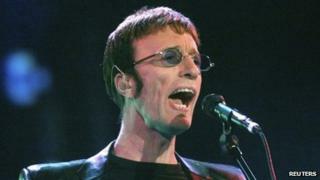 Figures from the worlds of music and politics have paid their respects to Bee Gees singer Robin Gibb, who has died at the age of 62. "It is hard to put it into words really. I just feel that The Bee Gees have been so much part of our industry. I always feel that we are a fraternity of people who sing pop and rock and Robin is another one of us who has gone too soon, too early. "The legacy will be what The Bee Gees did, which was stunningly good stuff, right on a par with The Beatles." "He was wonderful. He was a jokester. He had an incredibly witty sense of humour and was fun to be around. All three of them were sensational gentlemen first, just fun loving guys. "What was most attractive to me was how grounded they were. I think a lot of it has to do with their sense of family and being together as a family. I know exactly what that means, because I come from a family of singers. That's very important to be connected. "They loved each other very strongly and showed it, and it was a joy to be around it. "Their songs are easy to sing along with. Everybody enjoys the beats, the melodies, the words. I don't think there is anyone that can't sing five or six parts of a song of theirs." "What a tragedy this is for the music world. Robin was a part of something unique. The sound of the Bee Gees was so specific and dominating, especially in the '70s, unlike anything that had ever happened before or will ever happen again. "Mostly, Robin was a good guy who didn't deserve to die this young. We will all miss him for what he was as a person and what he brought to music." "Robin was not only an exceptional and extraordinary musician and songwriter, he was a highly intelligent, interested and committed human being. "He was a great friend with a wonderful open and fertile mind and a student of history and politics. I will miss him very much. My thoughts and prayers are with [his wife] Dwina and all the family." "Robin will be remembered as a musician and as a singer and part of The Bee Gees. The legacy they'll leave behind is Staying Alive, the harmonies and just the songs that they've written." "When you think in the late '70s but particularly in the early '80s they rescued a whole series of absolutely massive profile careers - Barbra Streisand, Dionne Warwick, Kenny Rogers, Diana Ross. "They provided the songs and production that gave these artists the biggest hits at the time that they'd had in years." "Robin had the most unusual voice, a great voice. All those wonderful songs like I Started A Joke and And The Sun Will Shine, they were just so beautiful. You couldn't have put another voice in there that would have done it any more justice than he did." "Robin Gibb RIP. Very sad to hear about yet another great singer dying too young." "We have lost a truly brilliant musician today. One of my idols. My heart goes out to the Gibb family in this time of sorrow... RIP Robin." "RIP Robin Gibb. A musical giant." "Why are we losing so many great artists! Robin Gibb you will be missed! And we will keep your music Staying Alive! #Night Fever! RIP"
"RIP Robin Gibb. The soundtrack of my wonder years is vaporizing one artist at a time with these iconic musical losses lately." "Just heard about Robin Gibb. I am devastated. Can't believe it. May he rest in peace. My thought and prayers are with his family." "Robin Gibb. You are and forever will be a massive influence and inspiration. Rest in peace." "Just heard about Robin Gibb. A good friend, a brilliant musician and a man who turned all of us into wannabe Travoltas! Rest in peace Robin." "We start believin' now that we can be who we are - Grease is the word... RIP Robin Gibb." "Sorry to hear about the passing of Robin Gibb of the Bee Gees. Our condolences to his friends and family."